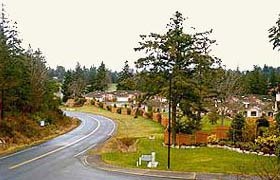 While the Regional Approving Officer of the Ministry of Transportation and Highways is the Approving Authority for fee simple, phased building strata and bare land strata subdivisions within the unincorporated areas, the Regional District of Nanaimo provides an integral role in the overall subdivision process for all Electoral Areas with the exception of Electoral Area 'B' (Gabriola Island). Upon receiving a formal application, the Regional District will review the submission from a land use and planning point of view to ensure that the applicable regional and provincial regulations (i.e., Municipal Act) will be able to be met. A typical review of a subdivision application includes examining the requirements of the current zoning, minimum parcel size and lot configuration, park and school site provisions, development cost charges, frontage requirements, development permit regulations and community servicing requirements. For existing buildings which are proposed to subdivided as a building strata under the Condominium Act and are situated on property located in Electoral Area 'A', 'C', 'E', 'F', 'G' or 'H', the Regional Board of Directors is the approving authority. An application for strata conversion is subject to meeting the requirements of the applicable official community plan, the Condominium Act, and current Board policy dealing with this type of subdivision. Contact the RDN's Planning Department for more information.